What is it about seeing an old tractor at rest in a field that stirs so much emotion and contemplation by many of us? Drive through any country landscape and you are guaranteed to see rusty old John Deere’s, McCormick’s, and Massey Ferguson’s alongside old barns or even proudly displayed as lawn ornaments in the front yard. Is there a chance that we all instinctually understand what we owe to the relationship man has had with this simple robust piece of equipment and how it has changed our lives over time? This relationship is easy to go unnoticed, but a news article I read the other day brought this into clearer context. That article led me to the discovery of another written in 2010 where a single tractor was having a major impact in a community of the war torn regions of Kosovo. As this article stated, an important element of Kosovo’s future stability and overall prosperity lies in the country’s ability to return and re-integrate refugee populations to their native homes in a peaceful and sustainable fashion. To improve the economic environment for returns, the community of Videje and municipal government presented a project to Mercy Corps to purchase a tractor and tractor attachments for the community’s needs. With a 30 percent contribution from the community, Mercy Corps supplied the remaining necessary funds towards purchase of the tractor. As one of the refugees said, “We had nothing without the tractor — the tractor does not care about nationality or religion. There are families that are planning to return and their land is already planted; when they return they will have wheat, corn and alfalfa to eat or trade,” Seven months after the program began, the economic benefits to the community are evident: more arable land planted, more corn harvested and more grass and alfalfa baled. The tractor has also provided chronically needed transport of products to local markets and raw materials to households. Perhaps more importantly — in addition to the economic benefits — the tractor provides a free-of-charge service to farmers for seven area villages, all of them of mixed ethnicity, all of which were formerly in conflict with one another. Now, more than 90 Albanian, Serb and Roma farmers all use the tractor to plough, harvest, bale, fertilize or transport, improving their farmlands and communities together. One of the continuing themes I strive for in my artwork is the representation of honest subjects that either at one time had, or currently serve a purpose and are relied upon to help scratch out a life in areas that would otherwise be inhospitable. 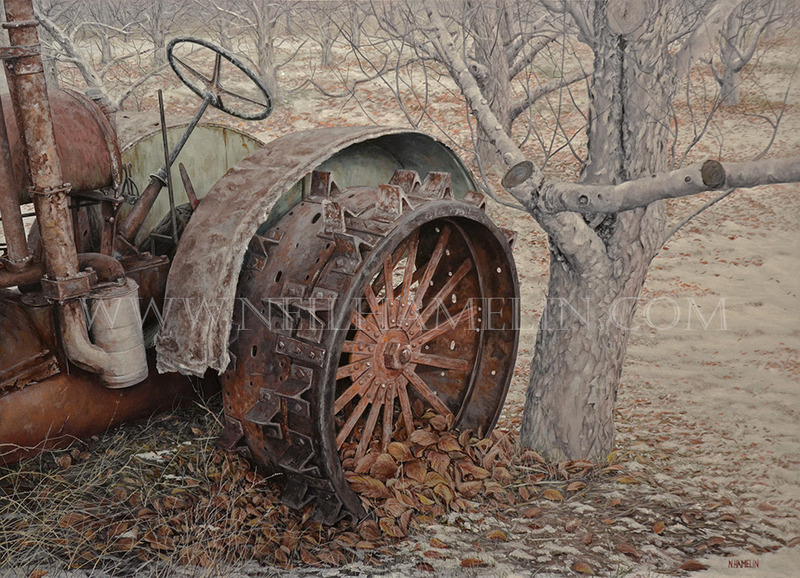 It is function over form that attracts me and the relationship between man and machine that inspires my paintings. 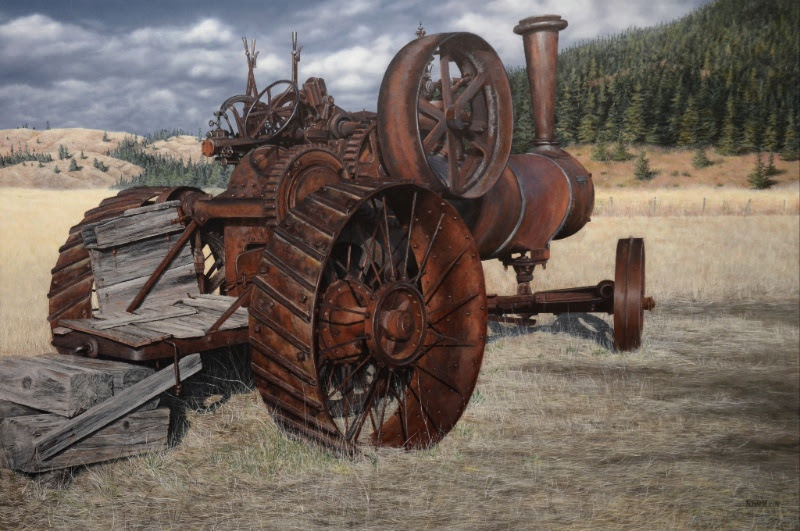 It’s easy to look upon an old tractor without the consideration of what it meant to those that operated it, and I find them to be a very suitable and noble subject to be immortalized in a work of art.